After publication of our article , we noted typographical errors in our tables and in the labelling of Figure 3 (Figure 1). There have been no changes to the results or their interpretation. Kaplan-Meier curve showing probability of survival during the first 28 days according to treatment group, among patients with sepsis. 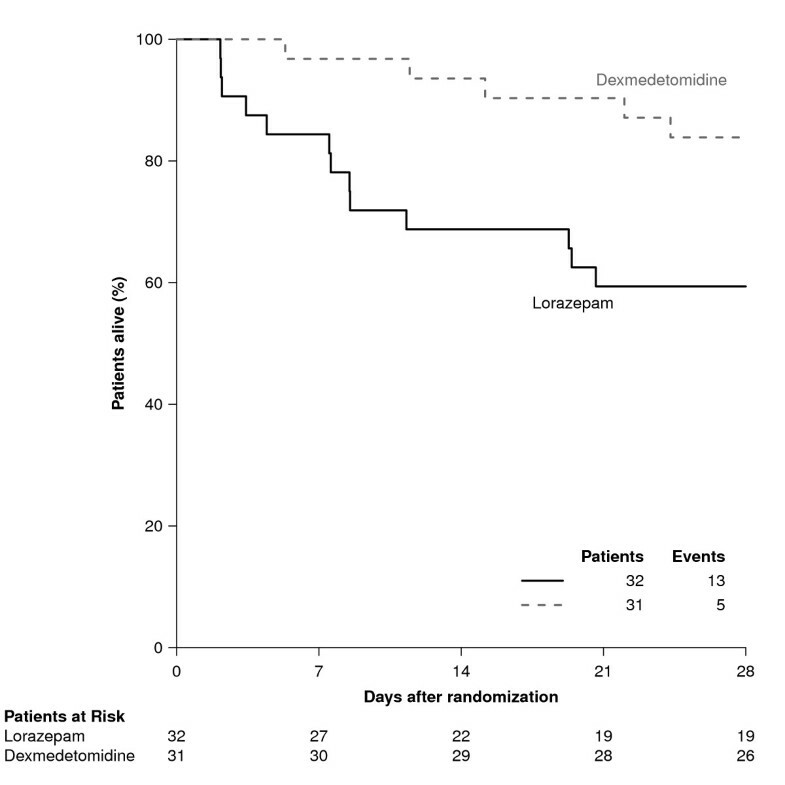 Dexmedetomidine decreased the probability of dying within 28 days by 70%; this beneficial effect was not seen in patients who were not septic (P value for interaction = 0.11 implying an interaction between sepsis and the treatment groups). In Table 1, 2 and 3 the number of dexmedetomidine patients without sepsis should read 21 instead of the published 20. The numbers in the corresponding text are correct. The corrected tables can be found overleaf. *Abbreviations: DEX, dexmedetomidine; LZ, lorazepam; APACHE II, Acute Physiology and Chronic Health Evaluation II; SOFA, Sequential Organ Failure Assessment; IQCODE, Informant Questionnaire on Cognitive Decline in the Elderly; ICU, intensive care unit; SIRS, Systemic Inflammatory Response Syndrome; BP, Blood pressure. *Adjusted P value obtained from the bootstrap multiple linear regression that calculated a difference in mean for each outcome between the two treatment groups, adjusting for age, severity of illness, use of drotrecogin alfa (activated) within 48 hours of enrollment, sepsis, treatment group, and a treatment group by sepsis interaction. **Indicates the number of days alive without delirium or coma from study day 1 to 12. †Indicates the number of days alive without delirium from study day 1 to 12. §Indicates the number of days alive without coma from study day 1 to 12. ‡Indicates the number of days alive breathing without assistance of the ventilator from study day 1 to 28. ** Measured during 120-hour study drug protocol, except for sinus bradycardia & sinus tachycardia, which are measured during entire study. In Figure 3 (Figure 1) in the "Patients at risk" table below the Kaplan-Meier curve, the dexmedetomidine and lorazepam labels are incorrect. The top row should be labeled lorazepam and the bottom row should be labeled dexmedetomidine. The corrected figure can be found overleaf.